We have a mostly white donkey (burro) who hangs out just over our neighbor’s fence. This little guy is extremely friendly but lonesome as it tries very hard to herd up with our horses. Our neighbor rescued the donkey, as he was not proving useful as a guard donkey and had no other particular skills to merit its feed and upkeep. Dandy, our large red gelding, especially likes the burro whose name I’ve not yet learned. Dandy and the burro tend to go nose to nose at the fence line, as if sharing secrets. Fancy, our paint mare, on the other hand tends to bare her teeth at the burro and appears jealous of Dandy’s interest in the little fellow. A poor farmer near Jerusalem owned a donkey far too small to do much work at all. He felt that he couldn’t afford to feed a worthless animal like this, one that could do him no good whatsoever, so at the supper table he told his family that he was going to kill the donkey. Then his oldest daughter suggested, “Father, tie the donkey to a tree on the road to town, and say whoever wants it may take it for nothing.” And the next morning, that’s what the farmer did. Soon, two men approached and asked if they could have the donkey. “It can carry almost nothing,” the farmer warned them. “Jesus of Nazareth has need of it,” replied one of the men. The farmer couldn’t imagine what a great teacher would want with such a worthless donkey, but he handed it over. The men took the animal to Jesus, who stroked the grateful donkey’s face and then mounted it and rode away. 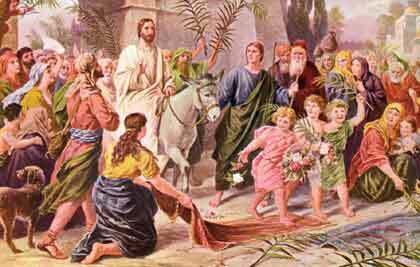 So it was on the day we call Palm Sunday, Jesus led his followers into the city of Jerusalem riding on the back of a small, common donkey. 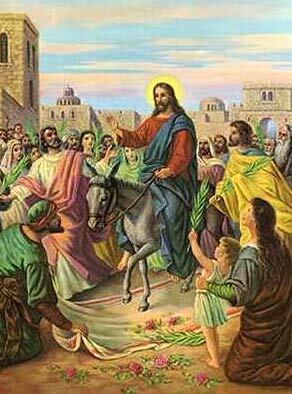 The donkey so loved his gentle master that he later followed him to Calvary. Grief-stricken by the sight of Jesus on the cross, the donkey turned away but couldn’t leave. It was then that the shadow of the cross fell upon the shoulders and back of the donkey, and there it stayed. 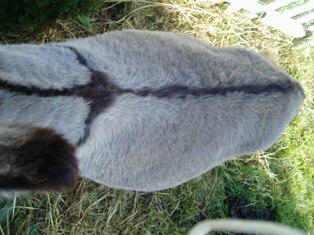 All donkeys have borne the sign of the cross on their backs since that very day. Excerpted from Sue Weaver, The Donkey Companion (Storey Publishing, 2008). So there it is, a Nubian donkey with a cross on its back here in the Texas Hill Country; a donkey like the one Jesus rode on into Jerusalem on Palm Sunday i. You just can never be sure of the potential worth an animal. For that matter we can never be sure what its human companions might also provide the world. Easter Blessings! What a beautiful Palm Sunday story about this humble animal friend! I didn’t know this story. It should be told to children. We need to all remember this and not be judgmental.